Our parts washers offer an eco-friendly washing of parts with a rugged machine made from stainless steel. They have a high stability and a long operational life. These machines allow an ergonomic and efficient operation. 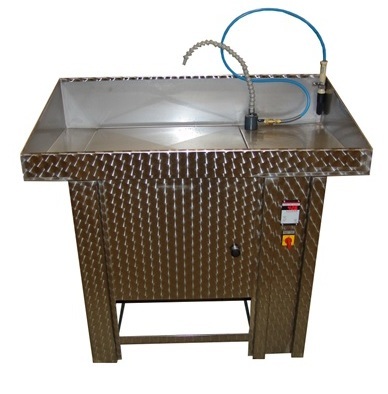 The cleaning medium is filtered and the parts washers are available in an insulated and a not insulated version. The PWT-ISO has an insulated tank, heated by an electric heating system. The medium is filtered during the reflux into the tank. In adition to the cleaning brush, the parts may be cleaned with the flexible hose system. The electrical controller "Parts Clean Control" supervises the medium level, the temperature and the heating system. The PWT 80 and PWT 120 have a non-insulated tank, heated by an electrical heating system. The medium is filtered by a stainless steel filter with wire mesh. The parts can be cleaned with the cleaning brush, a flexible hose system is integrated, too. These machines are non-insulated, the temperature is controlled with an electrical controller "Parts Clean Control". The PWT-ISO is a winner due to its rugged and functional construction. In this stainless steel parts washer, the full medium reflux is filtered by the integrated filter. Parts may be cleaned with a cleaning brush or a flexible hose system. In this way, the inherent dirt such as oil and grease can be detached efficiently. All parts in contact with the medium are made from stainless steel or rust-resistent materials. This permits a long operational life. The medium in the completely insulated tank is heated by a heating cartridge made from stainless steel. The powerful pump with a stainless steel pump head is activated by pressing the foot switch. It feeds the medium from the tank through an interposed filter cartridge to the cleaning brush or the flexible hose system. The parts washer PWT-ISO is a winner because of its easy handling and its rugged construction. Furthermore, the integrated system control makes the operation safe and comfortable. The parts are cleaned manually. When they are placed inside the washing tub, the parts may be cleaned with the cleaning brush or the flexible hose system. The cleaning mode can be chosen with a switch. By pressing the food switch (standard) or the palm button (optional), the pump and the medium flow are activated. During the cleaning procedure, the medium is filtered by a filter with stainless steel mesh and by a fine filter cartridge. The medium is heated by an electrical heating system. Digital temperature control "Parts Clean Control"
The parts washer PWT 80 and PWT 120 convince with their compact construction. All parts in contact with the medium are in stainless steel or non-rusting materials. This grants a long operating time. Dirt particles on the parts can be washed off thoroughly with the cleaning brush. The parts washer dispose of a tubular heating element in stainless steel of 2,0 kW. The machines are conceived for alkaline, aqueous cleaning fluids with pH-value of 7 to 12. The dirty parts have to be put into the washing tub on the work piece plate. With activation of the foot switch, the pump feeds the cleaning brush through the brush supply guiding with the heated medium. Now, the dirty parts can be cleaned thoroughly. The used medium flows through the stainless steel filter back into the tank. Electrical temperature control unit "Parts Clean Control"